Only dB Blockers™ have proven results for effectively eliminating noise-induced hearing loss. We participated with a company with 90 plants and approximately 9,000 employees and found that after fitting with dB Blockers, used in conjunction with an effective hearing conservation program, noise-induced hearing loss was virtually eliminated. As North America’s largest personalized, industrial hearing protector manufacturer, hearing conservation is our only business. We do not make hearing aid molds or disposable ear plugs. This exclusivity allows us to devote all of our research and expertise to the innovation of better hearing protection. As a result, we have made significant technological advances in the development of superior hearing protection. Serving over 4,500 companies and businesses around the globe for the past 38 years, our certified mobile technicians do custom on-site fittings at industrial sites or at one of our many associated retail outlets. 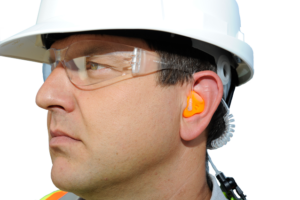 Eliminate noise-induced hearing loss in your company. Complete our “Get More Information” form and one of our industrial hearing protection specialists will contact you to discuss your hearing conservation program goals and recommend a dB Blocker™ model that will exceed your needs. Or you can call us at 800-520-0220, ext. 321.